California’s majestic redwood trees are in danger as poachers enter the sunshine state’s national parks to steal its wood to sell for furniture. 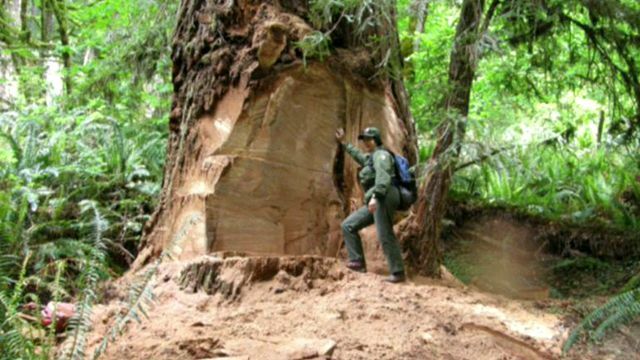 “It’s very disturbing, these trees are priceless,” Jeff Bomke, California State Parks Redwood Coast Sector acting superintendent, told Fox News Channel. The poachers are targeting burls, a knotted piece of wood that protrudes from the tree. One can wish for a fortuitous gust of wind to blow down a nice branch the next time one of these sacks of crap approaches one of these trees…! I don’t wish them death, just to have some sense dropped on their heads. Well, maybe death, too, but I’ll settle for what “Ye Gods” can provide. Makes me sick to see this sort of vandalism.